At San Diego Varicose Vein Treatment Center, we treat the veins in hands. When evaluating prominent veins in the hands we evaluate for other issues that are making them look the way they do. The three main factors that make hands look “old” include: 1) most importantly thick bulging veins that protrude from the back of hand, 2) age spots, 3) and tissue loss. Our hands age faster than any other part of the body, and can easily give our age away. 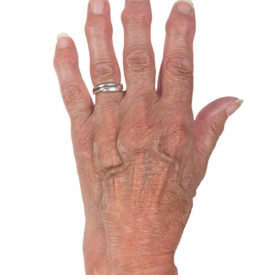 Although prominent hand veins are healthy veins that return blood to the heart, some may become bulgy and protrude at the back of the hand with age due to three factors: 1) the loss of skin and vein wall elasticity, 2) loss of subcutaneous fat and collagen 3) and water content of the tissues. Hand veins are treated with ‘painless sclerotherapy’ in a 15-20 minute procedure. Following injections you will be required to wear compression gloves for 12 hours and will be able to return to your normal activity immediately except for any strenuous exercise (gym), which you can resume the next day. For best results you may need to come in for 1-3 treatments. After the treatment we will need to see you for possible trapped blood. Sclerotherapy of the hand veins is a safe procedure. After the treatment there is minimal black and blue and occasionally mild swelling for 24 hours. 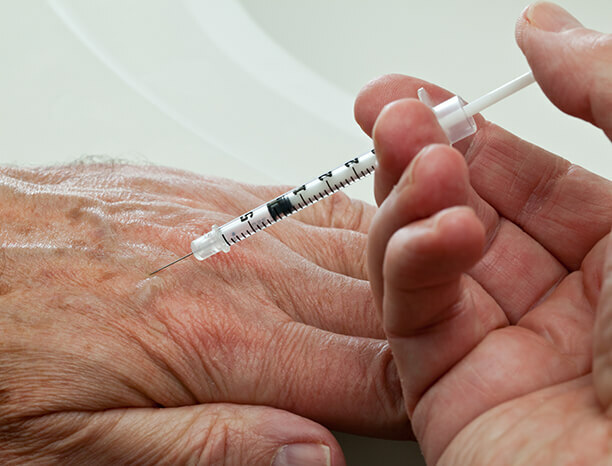 Sclerotherapy treatment is the best and the gold standard for treating hand veins. In rare cases mini-phlebectomy may be used. The outcome is excellent with long-lasting results.